Like many books I take out of the library, I went into Charlotte Cuts it Out almost completely blinded. I’d heard a couple bloggers talking about it, but I couldn’t recall the quality of their feedback. Knowing that I can usually trust contemporary novels for a good time, I was still curious and decided to give it a read. This turned out to be a just above average read for me- I didn’t dislike it nor love it. It wasn’t the most unique of stories, but the protagonist really resonated with me and it was quite fast-paced. Charlotte Cuts it Out is basically about a high schooler named Charlotte who is registered in a special program for cosmetology. She and her best friend Lydia have had a plan that would lead them to win a fashion design contest, but Lydia decides to drop out of cosmetology and pursue a different path. This means that Charlotte must participate in the contest all on her own. Will she be able to succeed by herself? I found that Charlotte was a very wise character, and I adored her. She did make a few impulsive mistakes during the novel, but she had no problem accepting them, learning from them, and growing from them. I also really appreciated her desire to work with cancer patients in the hospital, which goes to show others how huge her warm heart really is. Although Charlotte was fantastic, I didn’t like her selfish friend Lydia. She at first appeared to be loyal to her plan with Charlotte, so I was surprised and angered that she’d dropped out of the program without having a heart-to-heart with her first. Hence this, there was a lot of drama between the girls throughout the course of the novel, and this was one of the aspects of the story that I just did not enjoy at all. I noticed how similar the plot was to Susan Juby’s The Fashion Committee, minus the fact that TFC is more of a romance novel and this one only had a tiny splat of unnecessary romance. This is not a bad thing at all, but it just tells me that this book is not as unique as some others are and that it blends within the crowd. Despite saying that, though, I will say that it was for sure interesting enough to fully captivate me for 350 pages, but I wouldn’t really accept any higher number. There were some things about this story that were awesome plus some that bothered me, but at the end of the day, I still really enjoyed it. 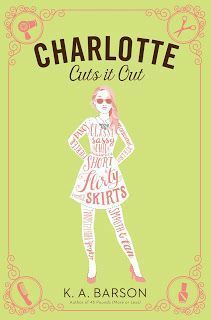 If you are into fashion, friendship, and teen angst in your books, then Charlotte Cuts it Out deserves to be read!